SDT Contracts has been undertaking turnkey school refurbishments for over 15 years with projects all over the UK. We work with clients to fully design the best layout for your classrooms using the latest furniture ideas, storage solutions and incorporating new, interactive technologies. We have a proven track record for project managing and delivering quality turnkey solutions, on time and within budget. The majority of our workload comes from schools asking us back time and time again. From Food Technology Rooms, Science Laboratories, Prep Rooms, Computer/I.T. Rooms, Art Rooms, Toilet Blocks or anywhere within your school we have the expertise to help. 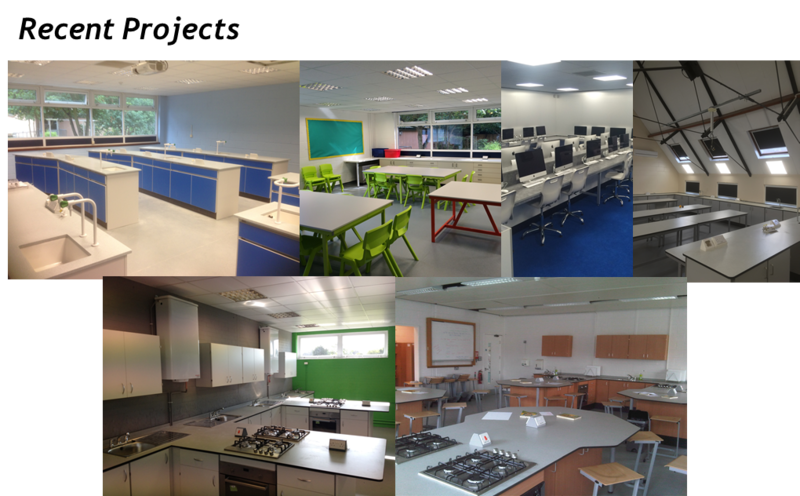 "SDT Contracts Ltd have installed a Science Laboratory and an IT Suite at Seaford Head School over the last two years. Their involvement from the very early stages of planning the projects to handing over the completed rooms has been dealt with totally professionally. Their understanding of the needs of a school environment is exceptional and is reflected i n attention to detail and the quality of the end result. I have no hesitation in recommending them for any similar such projects."